Thomas comes from a family of racers. His father, known to many as “Speedy,” was racing when Thomas was born in 1966. Ever since he was old enough to carry a wrench, he’s been involved in some aspect of the sport. In the span of 45 years, his family has won over 200 races in NASCAR modified touring races and many local races. He earned the Mechanic of the Year honor in 1998 for the Smart Modified Tour and assisted in more than 150 wins on the Modified circuit, which was a track record. 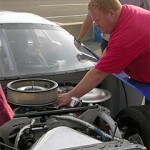 In 1999, Jon Wood requested Thomas to run his team as crew chief. Thomas accepted and became a B&H Motorsports team manager and crew chief until 2003 where he helped the team place second on the Hooter’s Pro-cup circuit and earn Wood rookie of the year. He joined the PHCC Motorsports faculty in 2005.